Maybe Nintendo should add more games to NES Classic Mini 2018 Edition, like 30 more games or swap out with 30 new games. After disappearing from store shelves, the NES Classic is returning next year. But that’s not all: the Super NES Classic will continue to be shipped through 2018. In Japan, the Super Famicom will still get shipped after October, and the Famicom Mini is going back into production. Hot damn. The SNES Classic was slated to end shipments this year, but more consoles will be released on September 29 for North America. The NES Classic will return next summer, after being discontinued this spring. Nintendo will announce more details at a later date. Nintendo made the announcement via Twitter that Famicom Mini production was resuming in 2018. The re-launch date will be revealed sometime in the future. REDMOND, Wash.—(BUSINESS WIRE)—Due to incredible demand for the upcoming Super Nintendo Entertainment System: Super NES Classic Edition system, Nintendo plans to ship the retro-inspired product into 2018. Originally, shipments were announced to cease at the end of this calendar year. In addition, more units of Super NES Classic Edition will ship on its Sept. 29 launch day in the U.S. than were shipped of NES Classic Edition all last year, with subsequent shipments arriving in stores regularly. Fans have shown their unbridled enthusiasm for these Classic Edition systems, so Nintendo is working to put many more of them on store shelves. The Super NES Classic Edition system features 21 legendary Super NES games such as Super Mario World, The Legend of Zelda: A Link to the Past and Super Metroid. Launching on Sept. 29 at a suggested retail price of only $79.99, Super NES Classic Edition plugs directly into the TV using the provided HDMI cable, and comes with two wired controllers. 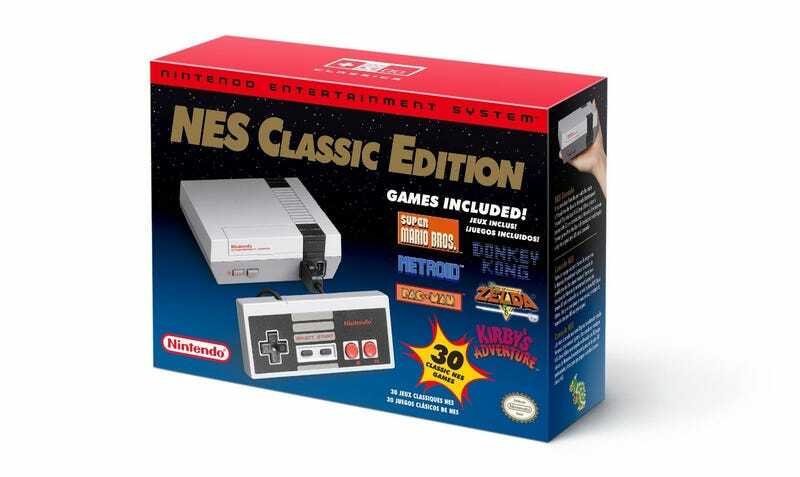 NES Classic Edition features 30 classic NES games such as the original Super Mario Bros., The Legend of Zelda and Donkey Kong. I rather have 60 games on it! 30 of the last set and 30 new ones! Make the old ones worthless just so the scalpers will cry!